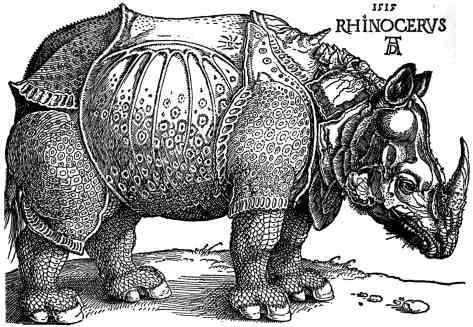 I’ve been a fan of the 16th century German artist Albrecht Dürer ever since I saw his print of a rhinoceros. It was put together from descriptions and someone else’s sketch: he never saw a real one. I love the scaly reptilian legs poking out beneath the sheet-metal armour, the shoulder horn, and the serrated hind-quarters. Dürer was also a master of religious art to rival any of his Italian contemporaries. But it’s only recently that I’ve learned of his interest in mathematics. In fact it was over at the Walking Randomly blog, in a post about pentaflakes: snowflake-like fractal constructions built from pentagons (check out the link for pictures). It was Dürer who first discovered them, in the second volume of his work Underweysung der Messung (‘Instruction in measurement’) in 1525 (almost 400 years before the discovery of the Koch snowflake). In the spirit of my recent post, Dürer’s 1538 revision of the Underweysung is also significant for his thoughts on polyhedra. This is the first known use of nets to analyse these shapes. Here, he can also claim discovery of two of the Archimedean solids: the truncated cuboctahedron and the snub cube. Another solid associated to Dürer is the so-called Melancholy Octahedron from his allegorical engraving Melancholia I.
Schreiber (1999) identifies it as a cube, first distorted to give rhombus faces with angles of 108° and then truncated so that its vertices lie on a sphere. As well as the rows, columns, diagonals, quadrants, corners and other significant 4-tuples all summing to 34, the bottom row also serves as a signature: the date 1514 is positioned inside the numbers 4 and 1: alphanumeric code for D and A.
It’s a delightful trick. 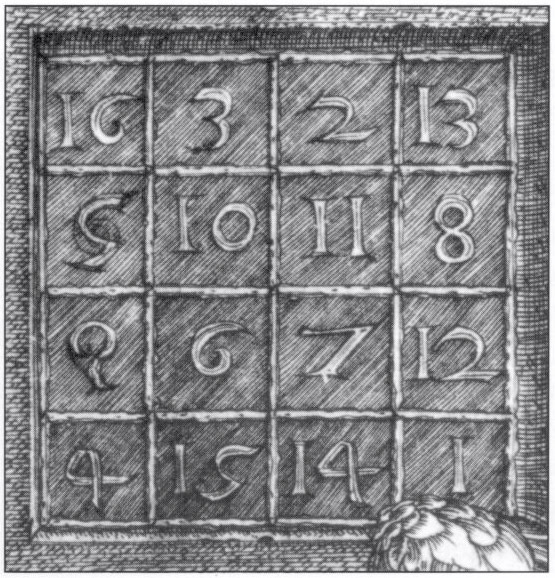 But Dürer’s influence on mathematics goes deeper. He contributed to the theory of ruler and compass constructions, and studied a variety of algebraic curves in some depth, including an account of logarithmic spirals a hundred years before Descartes or Bernoulli. The ultimate fusion of his artistic and mathematical interests came in his work on perspective, or more generally the problems of accurately representing 3-dimensional objects on a 2-dimensional space: so-called descriptive geometry. This is a fundamental question for artists, architects, and astronomers, as well as mathematicians, and its first systematic study is generally attributed to Gaspard Monge, almost 300 years later. In short, Dürer was not an artist toying with mathematics, but a genuine polymath, whose broad interests and talents led to inspiring achievements in both art, and science. He even has his own MacTutor biography, which is where I got most of the information for this post. Schreiber, P. A New Hypothesis on Dürer’s Enigmatic Polyhedron in His Copper Engraving ‘Melancholia I.’, Historia Math. 26, 369-377, 1999. You are such a hero! And love the website.